I have wanted to visit San Miguel—nestled just northwest of Mexico City—for many years. For one reason or another, I had never made the trip, but its allure kept it on my list. After spending three months in Porto in Portugal, San Miguel was my second extended stay for my “roving retirement” planned for 2017. I arrived in mid-April for a two-month stay. I was in awe of its beauty—full of vibrant colors, stunning art galleries, and top-shelf international restaurants. I rented a house through HomeAway in the Guadalupe neighborhood. Just a couple blocks north of the San Miguel city center, Guadalupe is a wonderfully authentic Mexican neighborhood, currently in the gentrification process. My house for my two-month stay was a two-story home on an old cobblestone street a block from the neighborhood school. Across the street was a small, one-man mercado (market) where I could pick up a bag of fresh pineapples, mangoes and oranges for roughly $3. Most days my lunch was all fruit. The house had two-bedrooms and two-and-a-half bathrooms, much more than I needed, and rent was $1,000 per month, including all utilities (electricity, water, gas, and WiFi) and a house-cleaning service twice a week. The first floor housed the living room and kitchen, the second floor the bedrooms, with a small sitting room between them, and the third floor held the rooftop and laundry room; all decorated in the beautiful colors and design of Mexico. I also had a rooftop garden, which I shared with the pigeons that roosted there every morning and some evenings at dusk. Trash pickup was announced at 6:30 a.m. every Tuesday, Thursday, and Saturday morning with the clanging of a bell. Which brings me to some of my most vivid memories, surprises, and loves of San Miguel: the sounds of the city. At least twice a week, a vendor would slowly drive the neighborhood streets selling and bringing propane gas tanks right to your door. With a megaphone speaker, he broadcasted his presence for all to hear. Sometimes the megaphone shouted a message in Spanish, other times a jingle played. The farmers selling fresh milk and produce would also announce their pending arrival—some with stereos mounted on their trucks. Most days I rushed to my window when I heard these neighborhood sounds. They were an unexpected gift of travel. And a peek into the rich Mexican culture. 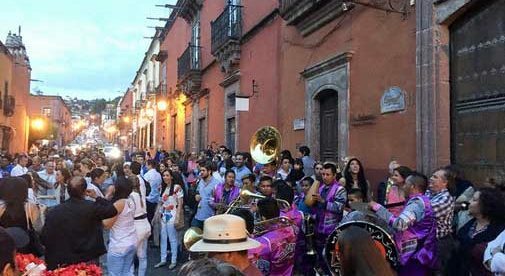 From fireworks celebrations when the sun goes down, to roosters announcing the arrival of a new day, life in colorful San Miguel is lived, loved, and enjoyed out loud.